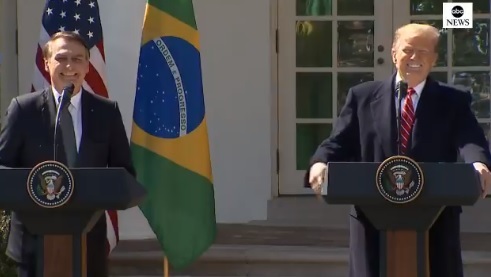 Brazilian President Jair Bolsonaro joined President Donald Trump at the White House today for a joint press conference. Bolsonaro, Brazil’s populist leader, lashed out at the Brazilian far left fake news media and quoted American President Ronald Reagan.] It was a GREAT speech! During the questions and answers Brazilian President Bolsonaro was asked about the possibility of a Democrat winning the US election in 2020. Bolsonaro told the reporters he believes President Trump will win. Brazil's Pres. Jair Bolsonaro, a fan of Pres. Trump, says he would respect the results of the 2020 U.S. presidential election but predicts that Trump will be re-elected.